Ran into another user on the dps channel having the same problem. - try restarting the computer and cleaning the log before starting STO or any other parser. 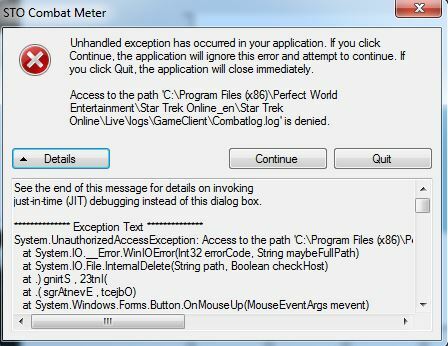 Just fyi I had this error as well running on win 7 ult. It's because STO is installed in c:\Program Files (x86)\ so the logs are there as well and writing or editing the log needs admin privileges. SCM uses a clickonce app to launch, which is easy for updates but has the disadvantage of not being able to be given admin privileges to run so as a result can't edit the log and gives that error. The only way I managed to make it work is to hunt down the executable of SCM, make a shortcut and run as admin. But that of course negates the auto-update so you'd have to check on a regular basis for any new release. Other then that it's cleaning the log manually (with your preferred reader run as admin) or deleting the log and creating a new one.